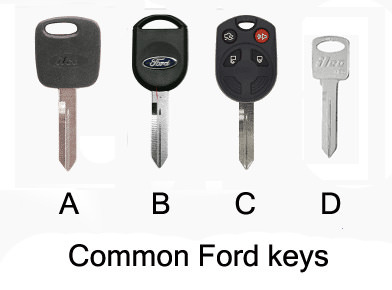 Ford "Chip" key basics. or; What blank key should I buy. Disclaimer: The Ranger Station.com, The Ranger Station.com Staff, nor the original poster are responsible for your use of this information. By using this information and following the how-to's, you, the reader, take full responsibility if anything is damaged or messed up. If you have questions, feel free to PM the original poster or ask in the appropriate section of The Ranger Station.com forums. Ford Ranger Transponder "Chip" Key Basics. Or; What blank key should I buy for my Ranger?? PATS is Ford Motor Company's Passive Anti Theft System, sometimes called “Securilock”. In 1996 PATS (PATS I) started showing up on select models of Ford and Lincoln Mercury vehicles. The keys for PATS equipped vehicles have a radio frequency transponder (aka: RFID) embedded in the plastic Head. For the 1999 model year, all Ford Motor Company vehicles equipped with the passive anti theft system started using the PATS II system. The PATS II system was introduced on roughly half of the PATS equipped vehicles for the 1998 model year. The other half of the PATS equipped vehicles for the 1998 model year were equipped with the PATS I system. When you attempt to start the vehicle, the onboard computer sends out a RF signal that is picked up by the transponder in the key. The transponder then returns a unique RF signal to the vehicle's computer, giving it the ok for the vehicle to start and continue to run. This all happens in less than a second, and is completely transparent to the vehicle operator. Today, most Ford, Lincoln, Mercury brand cars contain an anti-theft system and will require a "programmed" transponder key to start the car. In 2006, Ford came out with the IKT key “Integrated Keyhead Transmitter”, or remote head key, whereby the keyless entry remote is built into the head of the key. 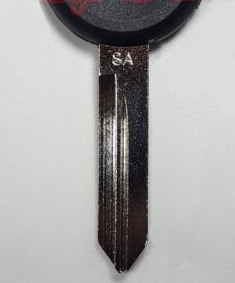 These keys with the standard Ford 8 cut blade can be replaced with a basic transponder key (40 or 80 bit depending on year) like the H84-PT and H92-PT Keys. This article will not cover the high security, laser cut key in introduced on some vehicles in 2009, or the Proximity System (aka; PEPS, Passive Entry Passive Start) available on certain later vehicles. Neither of which were available on the US model Ford Rangers. Note: Different locksmiths own different types of equipment and aftermarket keys use transponders made by different manufactures. Same with key blanks bought on-line, some are better than others. 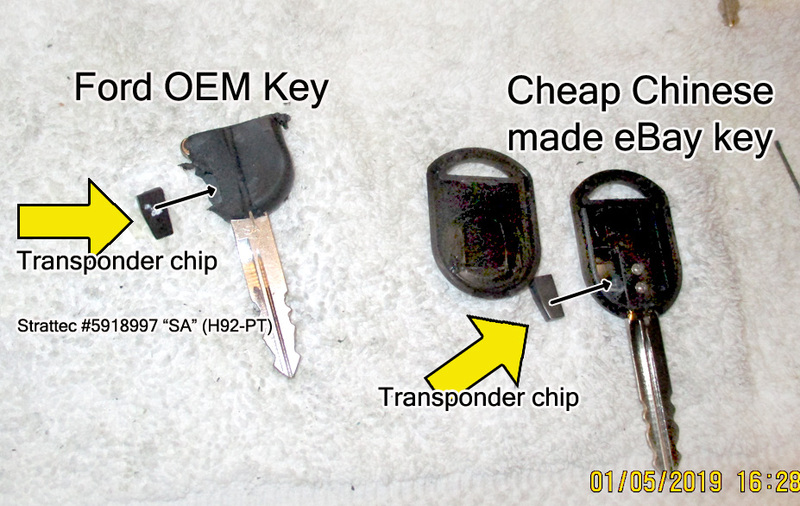 Encrypted Transponder keys, or common "chip" keys like the ones that came as original equipment and OEM replacement, have a preset, random encryption that needs to be programmed into the vehicle. Cloneable, sometimes called "Zero bitted" Transponder keys, are set up to be cloned and they have no preset encryption. How do you tell the difference? If the locksmith makes your key by inserting you key into a tool, than inserting a key blank into the same tool, they are cloning your key. If the locksmith takes a new key out to your car with a tool that he hooks up to your cars OBD port to program the key, he is adding a unique, encrypted "Master key" (sometimes called a "Primary Key") to your system. Keep in mind that if you have only two keys and one is a clone of the other, you will not be able to add a third key without going to a dealer or locksmith, or using Forscan to add the third key. A: H72-PT Early 40 Bit Transponder key. To my knowledge the H84-PT and H92-PT keys, even tho they will fit, will NOT replace this key. B: H84-PT and H92-PT Keys. The H92-PT 80 Bit key key (Strattec, pn 5918997 (Jewel) or pn 5913441 (Black)) is backwards-compatible with 40 Bit technology vehicles using the H84-PT (40 Bit only) keys. The two keys look the same. Note that neither will replace the H72-PT 40 Bit key. The H92-PT (OE 164-R8040) is considered a replacement for the H84-PT (OE 164-R0475) key. C: 80 or 40 Bit IKT (Integrated Keyhead Transmitter) Transponder key, equipped with a 3 or 4 button remote. The H92-PT key will replace this key. 2011 and 2012 Rangers were available with the 3-button version of this key. (OE 164-R8070, Strattec 5912560) H92-PT (OE 164-R8040) 80 Bit keys will work with these vehicles. D: Service key H-86, contains no transponder, has the same 8 cut blade as the H72-PT, H84-PT, H92-PT, H75, H75P and many other (Groove 82) keys, and will do everything but start a PATS equipped vehicle. As a general rule, all vehicles manufactured for the 2010 model year or earlier are equipped with 40 Bit technology. The Ford 80 Bit transponder-equipped key blanks are backwards-compatible with 40 Bit technology vehicles. However, Ford 40 Bit transponder-equipped key blanks are not compatible with vehicles equipped with 80 Bit technology. Your original Ford transponder keys should have an S, SA, H or HA stamped on them, S for Strattec and H for Huf. The Strattec keys have “S” (40 Bit) or “SA” (80 Bit) stamped above the milling on one side of the blade. Huf keys have “H” (40 Bit) or “HA” (80 Bit) stamped on them. Huf and Strattec are the only Ford authorized manufacturers of the Ford 80 Bit IKT Key blanks. Ford Ranger Keys by year, some years overlap (half years for example). 2001 - 2012; H92-PT 40 or 80 Bit (Replaces H84-PT, 40 Bit) PATS II and up. 2001 - 2010; H84-PT PATS II and up 40 Bit only. 1999 - 2000; H72-PT PATS I 40 Bit. 1998 - 2001; Rangers with 4cyl 2.5L SOHC Lima engines did not have PATS, H75 Non transponder. Service key H-86, contains no transponder, has the same 8 cut blade (Groove: 82) as the H72-PT, H84-PT, H92-PT, H75, H75P + others. If you have questions, corrections or information to add, please feel free to PM me or ask questions in the appropriate section of The Ranger Station.com forums. Again, if you spot an error or know of something to add, please let me know! I ordered two cheap chip keys from eBay, had them cut, but they wouldn't program.. (Yea I should have known better...) bad or just wrong chip. After programing in my original key and my new Strattec key, I removed the chip from the mis-cut Strattec key by using the wire brush wheel on my bench grinder to remove the soft plastic molding to the point that I could pull out the chip. Then I popped the cheap key open with a pocket knife (two piece case, see pic) and I replaced the cheap chip with the one I took from the Strattec key. Added as third key in the normal way, worked fine! I added a spot of white-out to the good chip so I wouldn't get them mixed up. I hope someone finds this useful! !